By: Franzini, Louis R.; Grossberg, John M.
In a book reminiscent of Oliver Sacks' The Man Who Mistook His Wife for a Hat, psychologists Louis Franzini and John Grossberg take us behind the tabloid headlines and media exposes to tell the real-life stories of emotionally damaged men and women driven to horrific extremes in their efforts to gratify their basic human needs for love and attention. Writing with compassion and offering many profound insights into the human condition, the authors provide rare, often wrenching, glimpses into the tortured worlds of necrophiliacs, who make love only to corpses, and "werewolves" who commit unthinkable acts of mutilation and cannibalism; of men paralyzed by the terrifying belief that their penises are disappearing into their bodies, and compulsive hair pullers, who pluck every last hair from their flesh; of paranoids who believe they are being stalked by their evil twins, and those convinced that everyone close to them is an imposter; and many others. All of the stories contained in Eccentric and Bizarre Behaviors are based on actual case studies. Throughout, Drs. Franzini and Grossberg discuss, in terms that general readers can understand, both the known and conjectural causes for the strange disorders they describe. And, in many cases, they recount the stirring details of how patients were ultimately rescued from the eccentric and bizarre patterns of behavior in which they had become imprisoned. 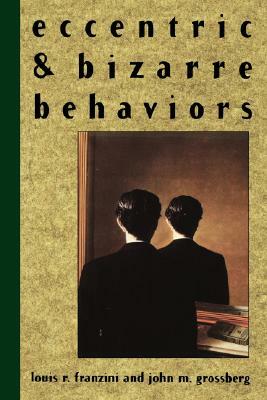 Author Name: Franzini, Louis R.; Grossberg, John M.
Keywords: PSYCHOLOGY. PATHOLOGY. DISORDER. ABNORMAL.